For a satisfying meal filled with beautiful views, laughter and great food! Ramadan, like everything else in Dubai, comes with an air of affluence and positivity. As the sun sets, the city's grand mosques light up with elaborated décor, the iftar and suhoor tables expand with the spirit of sharing and the multicultural city thrives in the blessings of the holy month. When it comes to Ramadan eateries, Dubai never disappoints. From exotic cuisines to local outlets, the city bustles with busy places. But an authentic Dubai-experience in Ramadan is incomplete without at least 1 trip to the famous Ramadan tents. High ceiling chandeliers, vintage crockery, authentic Arabic buffet, folk music and a view to die for — yep, that's what all Ramadan tents are about. If you need suggestions, here are the 5 best Ramadan tents in Dubai. Set against a backdrop of regal arches and wooden trellises, luxurious drapery and flamboyant accessories, Ewaan at Palace Downtown promises the traditional flavours of Arabia served with a majestic skyline. A true ode to the local culture. The price here may be on the steeper side but it's worth the lifetime experience. Price: Iftar - AED255 per person | Suhoor - AED170 per person | children ages 6-11 are half price. Ramadan meal at Al Majlis is all about beautifully decorated interiors, unforgettable family time and satisfying-to-the-core, á la carte menu. If you want some privacy, there is also a VIP area for that exclusive dining vibe. Glamorous as always, the beachfront tent at Atlantis has the reputation of being the best in the business. Every year, the tent lives up to the expectations and offers an unforgettable experience, with traditional oud players, dedicated prayer rooms, card games as well as other attractions. The Palm's official tent is proof that Ramadan offers a lot more than just good food. The Fairuz Ramadan tent promises a 5-star treatment to all its guest. Whether you are looking for an intimate space or something for a grander affair to celebrate this blessed time, the set-up here is perfect to experience the true style of Middle Eastern entertainment and hospitality. This Ramadan, RISE at Dubai Creek Harbour is here to impress. 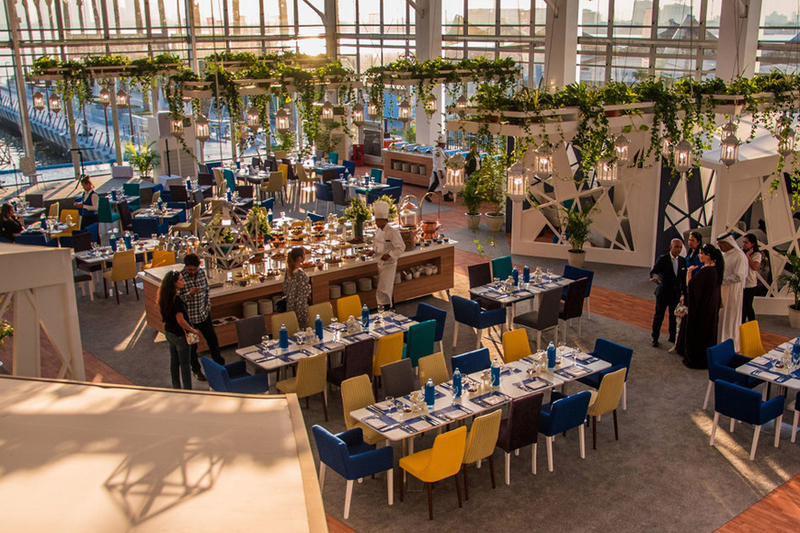 A breathtaking skyline view inside an artistic tent on Dubai Creek Harbour's waterfront followed with some lively set of activities including live performances, pop-up shops, workshops, live cooking and art exhibitions. There's never a dull moment here.